It’s an interesting and possibly shocking question, I know. Pardon me while I think out loud on the subject. Breaking it down further one sees where two worlds collide – personal and professional – blurring into 0ne and the same, resulting in the entrepreneurial individual acting very selfish. They instinctually strive to get what they want both in business and in their personal life. Most early stage founders are scrappy, shrewd and manipulating. Why? Because that is how you end up getting what you want. The fact is you have to be scrappy and find any opportunity you can to move your interests forward against a world suggesting otherwise. If not, people will doze you over with their own agenda and force you into a life you don’t want to live. That angst for being dozed over, for those uninitiated, is the root reason entrepreneurs exist. The problem lies in when one cannot turn it off once they leave the office. I think the reason why they can’t is because “leaving the office” just doesn’t happen as an early stage entrepreneur. An unfortunate reality can be found in the tension created between the good hearted and the driven. Through my self reflection I started to evaluate both those stances and realized it can be very difficult to be good hearted; giving-in and acquiescing to everybody in your life while at the same time driving headstrong to give up everything for your dream as an entrepreneur. The math just doesn’t work. After all, selflessness can be defined as putting yourself last, which taken at face value runs counter to what entrepreneurship means to each individual. People start businesses to feed their own needs first. More specifically, Bill Gates didn’t set out at 19 years old with the vision to donate all his wealth to the less fortunate and cure the world of disease. He set out to become one of the greatest technologist and capitalists the world has ever seen, all the while serving his self interests (and his company) earning massive wealth in the process. Based on stories from co-funders and early employees he was quite selfish in his ways. It was only after he made his billions and conquered the world (figuratively) that he decided to give it back, maybe realizing how selfish he had been during his early years in business. It’s quite easy to be selfless when you already have everything you want. The same selfish description has been reported with the late Steve Jobs. Notice that if all you did was replace the title of list above with “The Characteristics of a Selfish Person” it would still make sense. This is when I realized I am not only an entrepreneur but I am a selfish person. For someone who prides himself on being a “good hearted person” this is a tough pill to swallow. It may not be good news for everyone involved but I think its important to understand it and possibly unravel how to work/live with someone who suffers the entrepreneurial disease. Newly minted entrepreneurs, or people considering starting their own journey as a founder need to take note of the inherent flaws. You may already posses those characteristics and believe you were born to be an entrepreneur but if you don’t take account and ownership of your DNA, it will be a rough go. Starting a new venture is very difficult and not for the faint of heart. It also is not for the selfless, since the ability to overcome the massive inertia requires A LOT of inward focus – which means less time spent focusing on others in your life. You will self evaluate. You will self doubt. You will self organize and self determine. A lot goes on inside the mind of an entrepreneur focusing on their “personal” situation and thus replaces thoughts involving others. You need to know this, anticipate it and determine how you will live with it. Others suggest work life balance and the like (which to an extent I do agree with) but at some point you will need to pick which direction you will lean. Thinking you will be able to lean both directions at the same time is futile. Be prepared to make A LOT of sacrifices for a period of time in your life. Family members of an entrepreneur need to understand Entrepreneurship is a disease, and the symptoms are all listed above. Given that, practice a healthy balance of both understanding these inherent flaws in the person you love and firmness in your own principles. This will help you navigate the unknown road ahead. You need to be ready for challenging circumstances, tough conversations and compromises from both sides. You also should know that yes, most of time you are right and we are wrong. But we are actually seeing it from a skewed perspective – similar to how a schizophrenic might argue something you have no idea what they are talking about. So rather than fighting about right or wrong, gray or grey, work with us in how we can move forward with the least amount of collateral damage possible. You should also read this book by Brad Feld – Startup Life: Surviving and Thriving in a Relationship with an Entrepreneur. Close friends of entrepreneurs should know that although we try our best we are going to drop the ball, especially during the early stages. We will not be able to hang all the time, go on trips with you to cool places or grab drinks on a regular basis. Trust me when I tell you your founder friends really do want to grab drinks but they feel inferior if they need to depend on you to pick up the tab. We also work crazier hours than your 8-5 job so don’t be surprised when you text at 8 or 9pm and we’re still hacking away in the office. Most importantly, we just need your support and secretly we dream of hanging out as if nothing has changed from the “back in the day”. You may also think I am off base with all this selfish talk, maybe even saying to yourself “not true… I’m an entrepreneur and I’m not selfish”. As with all things, this topic is not black or white but probably a smearing of grey (or gray). I am curious of your perspective. This entry was posted in entrepreneurship, Founder and tagged Entrepreneur, Founder, selfish, selfless. Bookmark the permalink. As a young entrepreneur, I’ve personally dealt with people saying to do what I do I either need to be arrogant or extremely confident in myself. The first of these sound very negative and the second could be, when in extremes. I’d like to think that entrepreneurship was the passion I pursued just like other “less arrogant” people pursue their career dreams. This post brings up some great thoughts and the struggle with entrepreneurship and selfishness is very real. I’ve always been told that I am such a confident person. I feel that confidence can come across differently to different people. 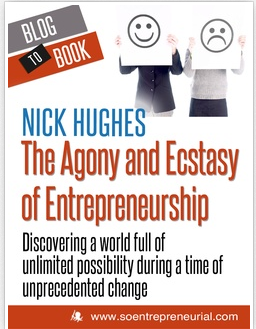 But I have to say Nick, I really appreciate you sharing your insights on being or even living with an entrepreneur. While the ‘characteristics’ do describe most entrepreneurs, I believe that while some may think, for example, head strong, is bad or selfish it is also part of being confident allowing us as entrepreneurs to keep moving forward. I did leave a corporate career of almost 23 years, and I find that world to be very similar. So it certainly is a great discussion and a reminder to be open, communicate with loved ones and friends so everyone has a positive experience. This is a very interesting article about entrepreneurs. I think essentially whether an Entrepreneur is selfish or not comes down to what their intentions are and why they are driven the way that they are. Obviously if you’re an entrepreneur ‘just’ for the money, then of course you most likely are selfish. Most true entrepreneurs have other intentions, not only money. Wealth can be seen as a sense of achievement to an entrepreneur rather than the money itself being important to them. Those who value achievement more than money are normally the most successful in terms of what they have accomplished. This was a fantastic article, thanks for that.